On Friday 24 January 2014, Japan became the 91st Contracting State to the Hague Convention of 25 October 1980 on the Civil Aspects of International Child Abduction. Japan’s instrument of ratification was deposited by H.E. Mr Masaru Tsuji, Japan’s Ambassador to the Netherlands, who was accompanied by several other officials. The broad delegation underlines the importance that the Japanese Government attaches to this event. Japan’s ratification of the Convention is indeed a milestone in the history of the Convention, which will provide a key tool to return children victims of cross-border abduction involving a Japanese parent. 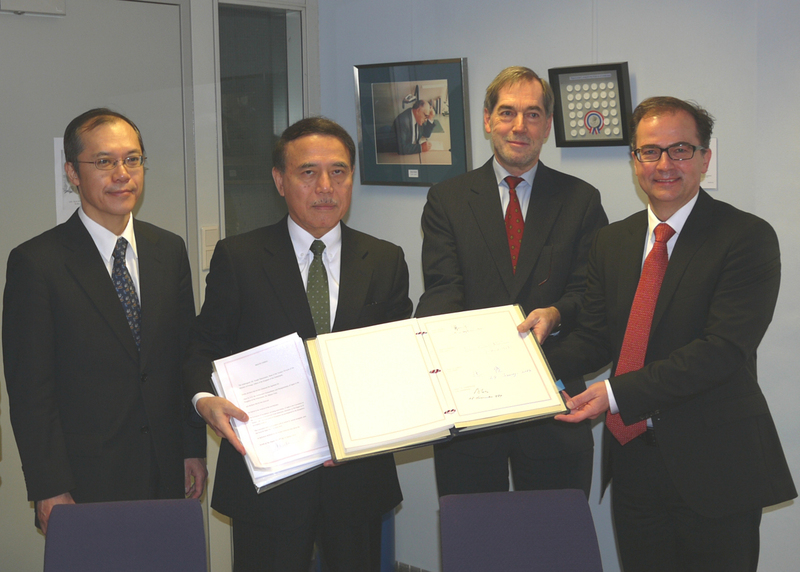 The Convention will enter into force for Japan on 1 April 2014. Secretary General Dr. Bernasconi, who was accompanied by Senior Legal Officer Kerstin Bartsch, warmly welcomed Japan among the Contracting States to the Convention. He also noted the very positive, long-standing collaboration between the Permanent Bureau of the Hague Conference and the Japanese Government, and indeed the international community, to prepare this important step. The Permanent Bureau looks forward to the continuation of joint efforts to provide for the effective protection and well-being of children worldwide.